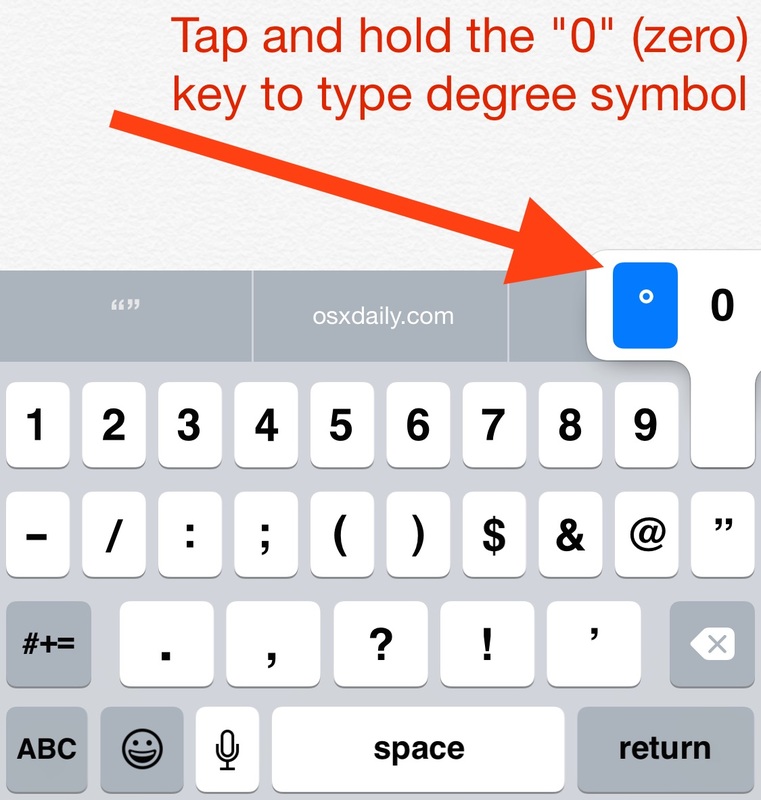 Ever wondered how to type the degree symbol on the iPhone, iPad, or iPod touch virtual keyboard on iOS? I did too, but not to worry, typing the universal symbol for temperature is really quite easy, here’s what you need to do. This is a piece of cake once you learn how to find the temperature symbol, but it’s not immediately obvious by any means, so many users are confused by this and understandably so. Just remember to tap and hold the Zero key on the keyboard and that’s how you get to the degree symbol, which kind of looks like a tiny zero anyway, right? Using this trick continues on through all versions of iOS, regardless of what the keyboard looks like in iOS 9 or iOS 6 or whatever else you’re running on that iPhone. Quite unlike typing it on the Mac with OS X and Windows, where you can just hit Option+0 there is no such Option/ALT key, instead you must use the tap-and-hold feature to access many of the alternate key options. You probably know by now that tapping and holding many keys on the iOS keyboard reveals alternatives, ranging from accented letters to special characters and symbols like this one. If you didn’t know that, now you do. By the way, this looks a tad different in various versions of iOS and depending on what keyboard you’re using in iOS, but the degree symbol is always accessible from the 0 key like this. Don’t miss our past article on how to improve typing on the iOS keyboard with a variety of tricks. Option+zero is not the degree sign. It is the masculine ordinal sign for Portuguese and Spanish; a superscript letter O. In some fonts the O is underlined. The degree sign is Shift+Option+8. You are right. Option-zero is typographically incorrect as the degree sign. The degree symbol (Shift+Option+8) is a perfect small circle that is baseline shifted and weight balanced. The difference is obvious if you greatly enlarge the two symbols or choose a different font such as Cambria. Thank you! The above comments are fine for OSBut holding down the zero key works in iOS. Such as: 68°. Shift+option+8 or Option+k for the degree symbol in OS X. And thanks for helping me find it in iOS! Been hunting high and low for it! Awesome!! i’ve been looking for this!